Lakewood Auto Body is a premier car and truck painting shop in Tacoma, WA. We are a family run, locally owned and operated business that was started in 1962 in a small 2-door garage. Presently, we have grown to a spacious and well-fitted facility. We are noted across the community for excellent truck and car painting Ford vehicles. We also offer auto body repair and general mechanical auto repairs. 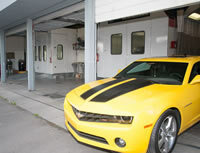 Lakewood Auto Body has I-Car and ASE certified, trained and experienced paint technicians, computerized paint matching systems, duel side-by-side painting booths and advanced painting techniques. We strive to deliver truck painting Ford Explorer Sport Trac services that make your vehicle even better looking than it did originally. Was your car in an accident recently? You must want it repaired and restored to its original look. In fact, now that you have to get it painted afresh, why not go in for the custom color paint that you had always desired to have on your vehicle? If you want your Cadillac to be painted with your favorite color, bring it to Lakewood Auto Body in Tacoma, WA. We offer superlative car painting Ford Fiesta that is unmatched by any other auto paint shop in the region. Mechanical repairs including engine repair, suspension system, AC system, etc. Why Lakewood Auto Body in Lakewood, WA? For the best truck painting Ford Cargo in Tacoma, WA, come to Lakewood Auto Body. Our high-tech paint shop uses the best quality paints & enamels. Paint techs with over 27 years of combined experience. Truck and car painting Ford with high quality industrial finish. Guaranteed to give your car the look and feel of a new vehicle. Lifetime warranty on auto body painting. Complimentary handwash detailing with auto body paint. Valuable tips to make your car paint and its shine last really long.